Confused about the best sunscreen to use? Lawrence E. Gibson, M.D., a dermatologist at Mayo Clinic, Rochester, Minnesota, offers his guidance. What are the most important things to know about protecting yourself from the sun? -- Avoid the sun during peak hours. Generally, this is between 10 a.m. and 2 p.m. -- regardless of season. These are prime hours for exposure to skin-damaging ultraviolet (UV) radiation from the sun, even on overcast days. -- Wear protective clothing. This includes pants, shirts with long sleeves, sunglasses and a wide-brimmed hat. -- Use sunscreen. Apply sunscreen generously and reapply regularly. Research supports the benefits of using sunscreen to minimize skin damage from the sun's rays. There are two types of UV light that can harm your skin -- UVA and UVB. A broad-spectrum, or full-spectrum, sunscreen protects you from both. UVA rays can prematurely age your skin, causing wrinkling and age spots. UVB rays can burn your skin. Too much exposure to UVA or UVB rays can cause skin cancer. The best sunscreen offers protection from all UV light. Does the best sunscreen have the highest SPF? SPF stands for sun protection factor, a measure of how well sunscreen protects against UVB rays. (UVA protection isn't rated.) Manufacturers calculate SPF based on how long it takes to sunburn skin that's been treated with the sunscreen as compared to skin with no sunscreen. 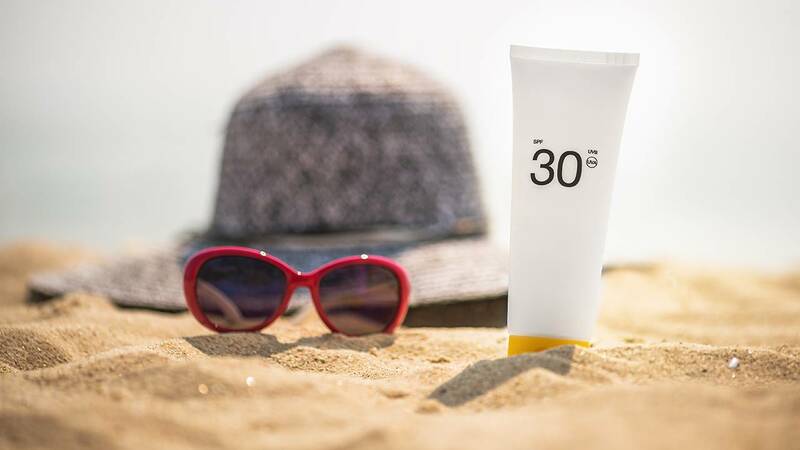 When applied correctly, a sunscreen with an SPF of 30 will provide slightly more protection from UVB rays than does a sunscreen with an SPF of 15. But the SPF 30 product isn't twice as protective as the SPF 15 product. Sunscreens with SPFs greater than 50 provide only a small increase in UV protection. Also, sunscreen is often not applied thoroughly or thickly enough, and it can be washed off during swimming or sweating. As a result, even the best sunscreen might be less effective than the SPF number suggests. What does water-resistant sunscreen do? The term water resistant means that the SPF is maintained for up to 40 minutes while swimming or sweating. Very water resistant means the SPF is maintained for 80 minutes. -- Organic. Organic sunscreens absorb UV radiation and convert it to a small amount of heat. Organic sunscreens might contain PABA derivatives, cinnamates, salicylates and benzophenones. -- Inorganic. Inorganic sunscreens reflect and scatter UV radiation. They might contain titanium dioxide or zinc oxide. Inorganic sunscreens are typically less irritating to skin. -- Insect repellent. It's typically recommended that insect repellent be applied no more often than every six hours. When using this type of combination product, reapply a sunscreen without insect repellent after two hours outdoors or after swimming or heavily sweating. -- Retinyl palmitate. The antioxidant retinyl palmitate is a form of vitamin A or retinol. Antioxidants are substances that neutralize free radicals -- unstable oxygen molecules that break down skin cells and cause wrinkles. While concerns have been raised about sunscreens containing retinyl palmitate, research suggests it's safe. However, recommendations regarding safety for use during pregnancy aren't available. If you're concerned, consider avoiding sunscreens containing this ingredient during pregnancy. Are some brands of sunscreen better than others? Brand matters less than how you use the product. Look for water-resistant, broad-spectrum coverage with an SPF of at least 15. Check the sunscreen's expiration date. Also, find a sunscreen you like. If you don't care for the sunscreen, you're not as likely to use it consistently. Should I use a spray sunscreen or a lotion? -- Creams. If you have dry skin, you might prefer a cream -- especially for your face. -- Lotions. Lotions are often preferred for application on large areas. Lotions tend to be thinner and less greasy than creams. -- Gel. Gels work best in hairy areas, such as the scalp and a man's chest. -- Stick. Sticks are useful when applying sunscreen around the eyes. -- Spray. Parents often prefer sprays because they're easy to apply on children. Because it's difficult to know how well you're applying spray, apply a generous and even coating. Or consider using a gel or cream first and using a spray to reapply sunscreen later. Also, avoid inhaling the product. Don't apply spray near heat, an open flame or while smoking. Do I need to apply sunscreen if I wear cosmetics that contain sunscreen? It depends on how much time you'll be spending in the sun. If you won't be spending too much time outdoors, wearing cosmetics that contain sunscreen, such as moisturizer and after-shave, is sufficient. However, if you will be spending a lot of time outdoors, use a stronger form of sunscreen. What else do I need to know about sunscreen? -- Apply generous amounts of sunscreen to dry skin 15 minutes before you go outdoors. -- Use sunscreen on all skin surfaces that will be exposed to the sun, such as your face, ears, hands, arms and lips. If you don't have much hair on your head, apply sunscreen to the top of your head or wear a hat. -- Reapply sunscreen every two hours -- and immediately after swimming or heavy sweating even if you're using a product that's water resistant. -- Remember that sand, water and snow reflect sunlight and make it more important to use sunscreen. -- Since UV light can pass through clouds, use sunscreen even when it's cloudy. You can apply sunscreen to children as young as age 6 months. Keep younger children in the shade as much as possible. Use sunscreen year-round, but don't let any product lull you into a false sense of security about sun exposure. A combination of shade, clothing, sunscreen and common sense is your best bet.